At Barrowby Church of England Primary School, we value the support of our parents and encourage them to be involved in the life of the school. 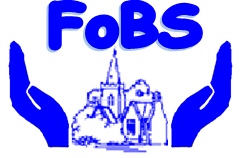 FOBS stands for ‘Friends of Barrowby School’ which actively supports the School and teaching staff by organising or helping to raise monies for the School. We are a registered Charity with officers including a Chairperson, Vice Chairperson, Treasurer and Secretary who are elected each year at the AGM (Annual General Meeting). If you have any questions about FOBS please contact either members of the Committee or school. Any parent/carer who has a child/ren at the School are warmly invited to attend the meetings which are held. There are different ways to serve the same Lord, and we can each do different things. Our meetings are held approximately once a month usually on a Friday afternoon, in school, during term time. They last for approximately an hour. There is an AGM held once a year, in the Autumn term. What fundraising events do we do? Yellow Moon Fund Raising Gift and Craft Catalogue. Name it Labels An easy way to keep a track of school uniform.